If cakes are the reliable, put-together friend in the world of desserts, caramel is the angsty adolescent. What's the secret to dealing with it? Give it a little slack. Caramel is sugar that's allowed to change, run a little wild, maybe dye its hair. Here, you're parenting your sugar, and it's an important job. Keep careful watch, but make sure to give it a little space to do its thing. There will be times when it'll slam the door on you, and you on it, but we have answers for that. Keep your cool, and everything will work out in the end. We love dissolving myths that you need special equipment to make a certain dish or sauce or meal. (And really, caramel can be all three.) 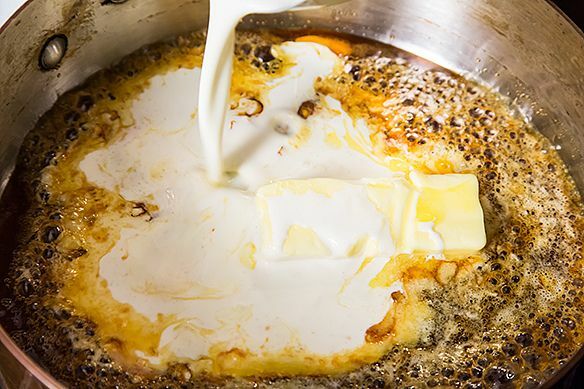 Any good saucepan or skillet will do the trick; if you’re adding cream or butter, you’ll want something deep enough to contain the ferocious bubbling that will take place. Heavy-bottomed is best for even heating, but if you’re a quick learner and/or a thrill-seeker, just about anything will work with the right amount of vigilance. Another thing you won’t need: a thermometer. You can use one for extra security, if you like -- it’ll be your caramel-making life preserver -- but it’s not necessary. Like our friend Dorie Greenspan says, “You learn to make it by look and smell, and that's not something a recipe can explain." David Lebovitz agrees: “My advice would be to realize that making caramel is done by eye, not by reading a recipe. It's hard to quantify it by saying how long it'll take, or what temperature it should be.” Put that thermometer down, and trust your senses. Technically, all you need to make caramel is sugar and a steady heat source. What sugar should you use? If you're just starting out, stick with refined white sugar -- it'll help you judge the color of the caramel as it cooks. Once you get good, you can experiment with other types for different and more complex flavors. That word is: dark. 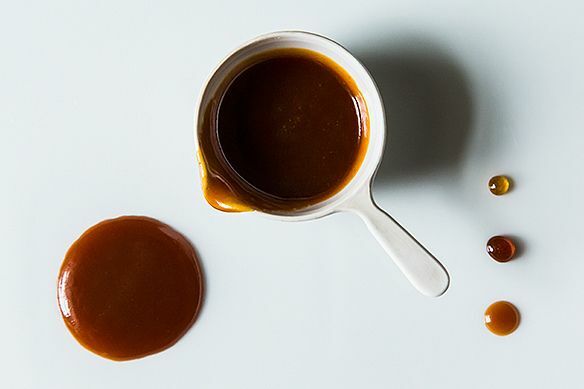 Generally, darker is better is more flavorful when it comes to caramel, so adopt that as your mantra and recite it repeatedly when you’re at the stove. Tattoo it if you must, but we bet you’ll get the hang of it before things get to the permanent ink point. 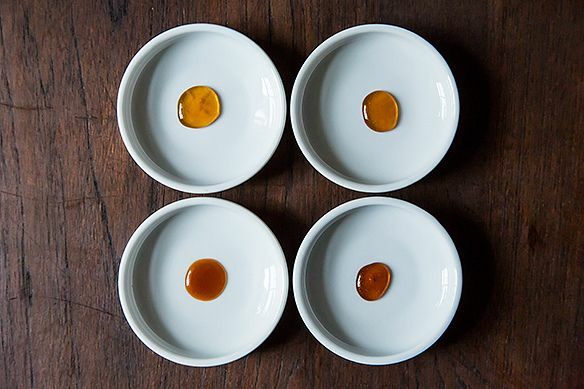 For a perfect caramel, you’re looking for a dark reddish-brown, or as David Lebovitz says, the color of an old copper penny. You can do this one of two ways. 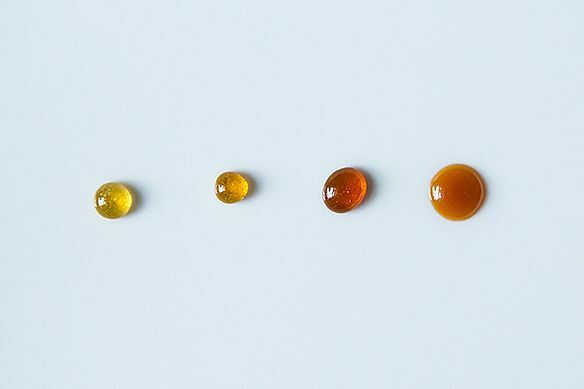 You can melt sugar with a liquid and cook it to caramelization (known as a wet caramel), or you can put sugar in a pan, all by its lonesome, and cook it until it liquifies and begins to darken in color. The latter is typically less temperamental, and the way to go for a simple caramel or sauce. Ready? This is the fun part. Get your other ingredients ready if you're making a sauce. If you don't, you could find yourself running around the kitchen, frantically grabbing butter sticks, digging in the fridge for the dairy, and typing "what caramel should look like" into your Google Images search bar while sugar is bubbling away like a lava spring on the stove, lapping you as it creeps closer and closer toward black on the color spectrum. You can't do that. Things move quickly. Trust yourself, trust your nose and your eyes, and pour your sugar into an even layer in your pan. Take a deep breath. Then crank your heat to medium. 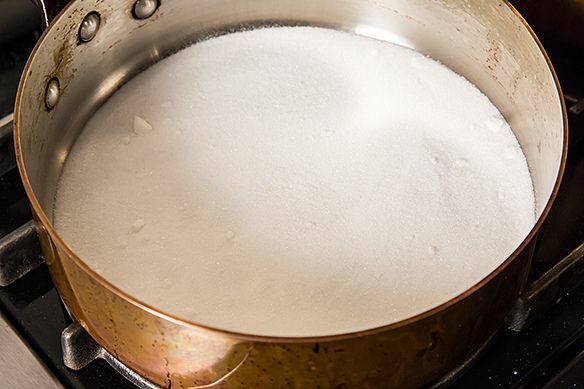 The sugar will give in to the heat first around the edges -- when this happens, gently help it along by stirring the melted pools into the center of the pan. Be careful not to over-mix, or you'll end up with a dry and crumbly mixture. If this happens, all is not lost: just lower the heat and re-melt slowly, stirring as little as possible. At this point, it should look light and syrupy. You’re not done yet -- caramel this light just tastes sweet and underdeveloped. The caramel will quickly skip over golden and make a beeline for reddish-brown. Here, all of the sugar’s caramelization has taken place. This should be just past the smoking point, and it should smell deep, fragrant, and like something you'd like to slather on your apples. This is what you’re after. Stop your cooking now. You know by now that hot sugar tends to have some legs on it, and if given the chance, it will run on you. Fast. Once it gets to your desired color, you have to stop the cooking somehow. 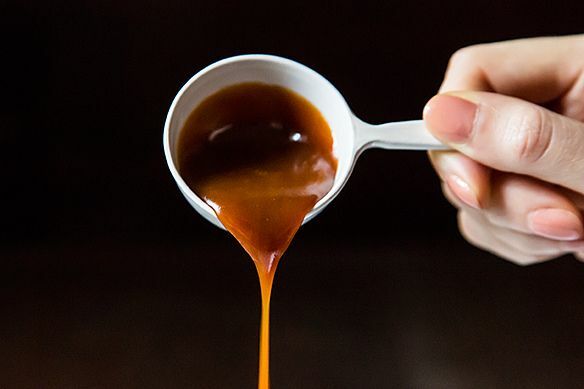 If you want pure caramel, for spun sugar or the like, this means you’ll have to have an ice bath ready, into which you’ll dunk the bottom of your pan. For sauce-makers, the job is easier: just add in your cold ingredients, and they’ll stop the cooking. Right in its tracks. Exercise caution for this part -- pull out your safety goggles if you have to -- hot sugar is extremely hot, and this will bubble like mad. But all it needs is a little time. Melt everything completely, kill the heat, and it will fizzle out. Now you have caramel, and everything is better. See? Just like we promised. Recently I discovered how to make caramels with honey and icing sugar...the only thing i'm struggling with is how to get them all in a bag without sticking to each other in one day. I tried icing sugar but at the end of the day the caramels absorbs that and they go sticky again. Anyone with a great tip? I used to be able to make caramel! In my adult life, I have had a terrible time. I wonder if it's a difference with the sugar I use. I used to use plain white sugar, with the pristine white color. Nowadays I use a cane sugar (not sugar in the raw) that comes from the bulk bin at the natural foods store. Is the residual molasses that makes my sugar "blonde" and not white messing things up? I can get the sugar to liquefy and then it crystallizes and seizes. Each time I can add water and get it to melt, but the crystals that seeded the first time continue to make it seize when the water evaporates. Is this a sugar issue? In the quest for the best homemade caramel I have found the following fixes possible: If your caramels come out too soft you can remelt and bring to temperature and re pour them. It's a matter of cooking the excess liquid out that is keeping them from setting up correctly. Same thing for caramels that come out too hard like sugar daddys. Chop and remelt then add a little cream to put back liquid that was accidentally cooked out the first time. Finally, using honey as part of your sugar is really tasty and if you have honeycomb add some to your mix. I think the beeswax helps the caramels set up better when the wax solidifies. (not talking about a lot of wax just a bit) Also in some batches with honeycomb there is a pleasant crunch from little bits of honeycomb in the caramels. It's not a beginners bag of tricks, but when push comes to shove and you don't want to dump the batch I've tried both these fixes and they both worked perfectly. all these baking tips are FANTASTIC! THANK YOU! a much-needed pre-holiday post! So you are supposed to cook until it starts smoking? I thought that if it was smoking it meant it had gone too far. A few weeks ago I was making a few batches of caramel and one of them started smoking, and then after it had a burnt bitter aftertaste. Some people like that but it wasn't what I was going for. Great, thank you. The first time this happened I was actually using an enameled cast iron pot, which I think was too heavy--I took it off the heat when it looked done, but then it kept cooking from the residual heat in the pan! The recipe I was using said to wait a minute before adding in the cream, so while I was waiting it went ahead and burned anyway. Live and learn! I think I am getting the hang of it now though. As you said, it's really about experience and not relying on a recipe. I made this caramel yesterday and put it in a glass canning jar in the fridge overnight. It's actually better today. The flavor has intensified and it has set up to be a paste. Really wonderful. Thanks for the recipe. This is a great primer on caramel, making. Thanks for sharing! If anyone is looking for a great recipe for dipping apples, I have made this one many times and it is wonderful! The caramels I've seen for coating apples usually have more ingredients than just your standard sugar, butter, and cream. I suppose you could try this one (and yes it does thicken as it cools), but from what I've read, you might be better off with a recipe for caramel apples. (Simply Recipes has a decent, straightforward one.) In these types of recipes, maple syrup is mostly just used as a flavoring agent, meaning you need the actual sugar in there to do the bulk of the caramelizing work. All of this talk and I officially want a caramel apple -- best of luck with yours! How much salt would I add to make salted carmel. When is it added? How much salt would I add to make salter carmel. When is it added? There is a lot of flexibility in salted caramel. 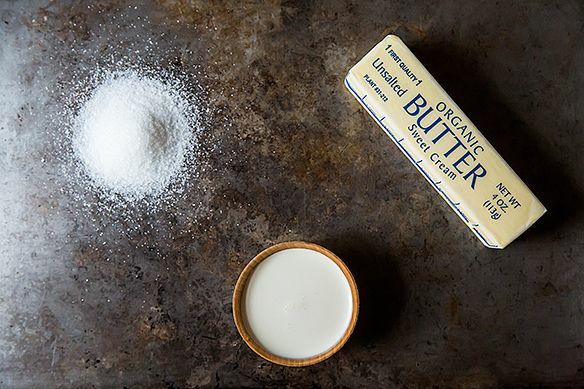 You could use salted butter in your sauce, or you could add it just when you stop cooking so it melts, if you like -- if you're using 1 cup of sugar, I would start with 1/2-1 teaspoon, but this really depends on your taste. You could also sprinkle a flaky salt over the finished sauce (that way you get a texture contrast). I've made caramel lots of times for a bread pudding topping. It's actually pretty easy, so if you are having issues, I think you are stirring it too much, or messing with the sugar-heating process in general. Joy of Cooking has a very good caramel recipe and the secret is (which I have learned by messing it up), DON"T MESS WITH THE SUGAR. Occasionally swirl the pan around on the heat , but your spoon doesn't even need to go in there until the very end to blend the butter and cream. Why does my caramel sauce crystallize when I put it into the fridge? It's fine when I first make it, but when I take it out to reheat (usually in the microwave) in the following days, I get small granules of crystallized sugar throughout the sauce. 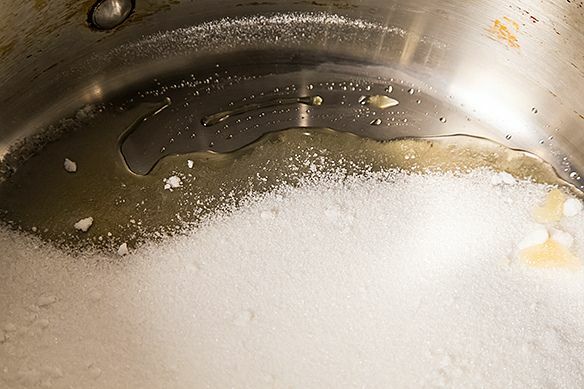 It may not be the fridge -- the problem could be happening in the first stage, if all of the sugar crystals failed to melt, or if there were any left over on the side of the pan. A trick I've read for the latter is to dip a pastry brush in water to "scrape" down the sides of your pan. It could also be something as simple as the shelf life -- sometimes the sugar in caramel will crystallize if it's been stored too long, so just make sure you eat it up quickly! I use the pastry brush and water technique myself. I try to bring the sugar temp to between 350-360 before I add the butter. I don't keep the sauce longer than a month in the fridge. I have heard that adding corn syrup to the sugar will prevent crystallization. What do you think? I've read that the corn syrup trick works in a lot of places! I like to avoid any extra ingredients when I make caramel, but if you're having trouble with the crystallization, I say go for it. I'll try it and let you know. Thanks again for your help!! Is there a list of ingredients and proportions that I have missed? Thanks for the article - I over mixed my dry caramel and fashioned some impressively cement-like sugar flakes. That's the worst! But totally fixable. A lot of recipes differ, but I have a standby sauce: melt and caramelize 1 cup of sugar, and when it gets to your desired color, add in 3/4 stick of butter and a half cup of cream. So here is my question/comment. When I make caramel in either fashion, something goes awry. When I pour the cream into the caramel and stir the two never mix. Instead what I get is a lot of liquid and crackling hard caramel fixture around my mixing utensil. What is causing this and how do I prevent it from happening? Hm, that's a tough one. I would try making sure that your caramel is still very hot and fully liquid when you add the cream -- if it has had any chance to cool, it will start to seize up. You could also switch to a whisk at that point as well, which will help you incorporate your ingredients if they decide to be a bit stubborn. That ALWAYS happens to me. I typically turn the stove off, but leave the pot on the burner for residual heat. As the cream in the mixture heats up, the caramel will eventually melt and your sauce will be complete!